"Everything in the Name of the Lord Jesus"
Michael J. Hoeppner was born June 1, 1949, to Joseph and Anna Hoeppner in Winona, MN. He has three siblings: Patricia, Edward, and Mary. He attended Cathedral Grade School, Cotter High School, St. Mary's College, and Immaculate Heart of Mary Seminary, all in Winona. Bishop Hoeppner undertook his theological studies at the Pontifical North American College in Rome, Italy, and was ordained to the priesthood for the Diocese of Winona on June 29, 1975, by Pope Paul VI at St. Peter's Basilica in Rome. He holds a degree in Sacred Theology from the Gregorian University in Rome. In 1985, he began studying for a degree in Canon Law, and in 1987 was awarded a JCL, (Licentiate) in Canon Law from St. Paul University in Ottawa, Canada. 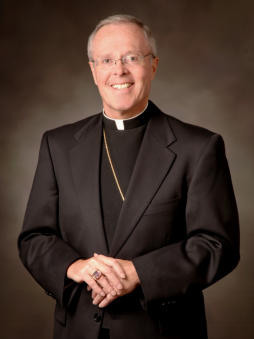 In addition, Bishop Hoeppner has served at St. Joseph the Worker Parish and Loyola High School, Mankato; as chaplain of the Motherhouse of the School Sisters of Notre Dame and instructor at Good Counsel Academy, Mankato; was a faculty member of Immaculate Heart of Mary Seminary, Winona; principal of Pacelli High School and at Queen of Angels Parish, Austin; administrator of Queen of Peace Parish, Lyle; chaplain at Sacred Heart Hospice, Austin. He has served as pastor of St. Vincent de Paul Parish, West Concord; pastor of St. Francis de Sales Parish, Claremont; associate pastor of St. Stanislaus Kostka Parish, Winona; pastor of St. Paul Parish, Minnesota City; pastor of St. Casimir Parish, Winona; pastor of St. Rose of Lima Parish, Lewiston and St. Anthony Parish, Altura. For the Diocese of Winona, he served as Judicial Vicar, Director of Vocations, Director of Continuing Education for the Clergy, Moderator of the Curia (chief of staff for the diocesan bishop), and was appointed to three, three-year terms of Vicar General of the Diocese. In addition, he served on the Diocesan Pastoral Council, the Presbyteral Council, the Priests Assignments Committee, the College of Consultors, the Diocesan Finance Council and the Board of Directors of Catholic Charities of the Diocese of Winona. Bishop Hoeppner was ordained and installed as Bishop of the Diocese of Crookston on November 30, 2007. The galero (an ecclesiastical hat) is in use today in ecclesiastical heraldry as part of the achievement of the coat of arms of a Roman Catholic prelate. The color of the galero and number of fiocchi (tassels) indicate the cleric's place in the hierarchy. A bishop's galero is green with six tassels per side. 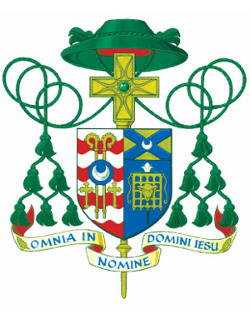 An archbishop's galero is also green but has ten tassels.Both patriarchs and cardinals have a galero with fifteen tassels; the difference being that a patriarch's is green while the cardinal's is red or scarlet.